Crap, I can write a better one in less than 10 minutes. Not a bad app, but why not just use IMAP with Thunderbird or Outlook Express? There must be a market for it, and it's cool that it's open source. Just not all that awesome in concept, I guess. With this add-on my google account does not stay logged on when Firefox is closed and then restarted. Also the favicon notification says I have 3 unread messages when I actually have no new mail. Gmail Notifier is bug-free.I do like the look of the context menu of this app, but it is poor for functionality. I would recommend Gmail Notifier instead of this app. The best multi account manager for Gmail no doubt about that. Just one question...why doesn't the update come through the usual channels like all the versions before? Even I would prefer stand-alone app that have same look & feel & functionality by my opinion this is best Gmail account manager so far. Thumbs up! To Anjin771, this extension logs in the same as you would if you went directly to the login page for Gmail. There is no difference and the security is the same which uses SSL encryption. All passwords are stored in Firefox's password system and are protected. Hopefully that clears that up! It seems to do all the work in cleartext (e.g. not encrypted). Whilst okay with some users this is totally not okay with others (I would say all should resist). Other than that usability and functionality seems just great! To Tenoq, thanks for that absolutely useless review. Who cares if Thunderbird checks your Gmail. What does this have to do with rating this program? Program works perfectly in Firefox - the best Gmail extension out there. Very useful firefox extension, especially for gmail users. he probably means you can't sign up for gmail accounts in the uk any more. now all uk users have to go with a 'yourname@googlemail.com'-style name. could you elaborate your UK statement? I am in UK and I am using gmail. What is the problem? 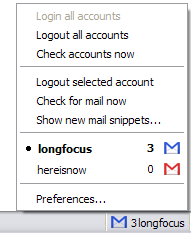 Kinda seems a little superflous if you're using any sort of e-mail client? Thunderbird checks all my Gmail accounts just fine, thanks - and any other e-mail client would too.